This article is about the unit of length. For other uses of "metre" or "meter", see Meter (disambiguation). The metre (British spelling and BIPM spelling) or meter (American spelling) (from the French unit mètre, from the Greek noun μέτρον, "measure") is the base unit of length in the International System of Units (SI). The SI unit symbol is m. The metre is defined as the length of the path travelled by light in vacuum in 1/299 792 458 of a second. The metre was originally defined in 1793 as one ten-millionth of the distance from the equator to the North Pole – as a result the Earth's circumference is approximately 40,000 km today. In 1799, it was redefined in terms of a prototype metre bar (the actual bar used was changed in 1889). In 1960, the metre was redefined in terms of a certain number of wavelengths of a certain emission line of krypton-86. In 1983, the current definition was adopted. Metre is the standard spelling of the metric unit for length in nearly all English-speaking nations except the United States and the Philippines, which use meter. Other Germanic languages, such as German, Dutch, and the Scandinavian languages likewise spell the word meter. Measuring devices (such as ammeter, speedometer) are spelled "-meter" in all variants of English. The suffix "-meter" has the same Greek origin as the unit of length. The etymological roots of metre can be traced to the Greek verb μετρέω (metreo) (to measure, count or compare) and noun μέτρον (metron) (a measure), which were used for physical measurement, for poetic metre and by extension for moderation or avoiding extremism (as in "be measured in your response"). This range of uses is also found in Latin (metior, mensura), French (mètre, mesure), English and other languages. The motto ΜΕΤΡΩ ΧΡΩ (metro chro) in the seal of the International Bureau of Weights and Measures (BIPM), which was a saying of the Greek statesman and philosopher Pittacus of Mytilene and may be translated as "Use measure! ", thus calls for both measurement and moderation. In 1668 the English cleric and philosopher John Wilkins proposed in an essay a decimal-based unit of length, the universal measure or standard based on a pendulum with a two-second period. The use of the seconds pendulum to define length had been suggested to the Royal Society in 1660 by Christopher Wren. Christiaan Huygens had observed that length to be 38 Rijnland inches or 39.26 English inches; that is, 997 mm. No official action was taken regarding these suggestions. In 1670 Gabriel Mouton, Bishop of Lyon, also suggested a universal length standard with decimal multiples and divisions, to be based on a one-minute angle of the Earth's meridian arc or (as the Earth's circumference was not easy to measure) on a pendulum with a two-second period. In 1675, the Italian scientist Tito Livio Burattini, in his work Misura Universale, used the phrase metro cattolico ("universal measure"), derived from the Greek μέτρον καθολικόν (métron katholikón), to denote the standard unit of length derived from a pendulum. As a result of the French Revolution, the French Academy of Sciences charged a commission with determining a single scale for all measures. On 7 October 1790 that commission advised the adoption of a decimal system, and on 19 March 1791 advised the adoption of the term mètre ("measure"), a basic unit of length, which they defined as equal to one ten-millionth of the distance between the North Pole and the Equator. In 1793, the French National Convention adopted the proposal; this use of metre in English began at least as early as 1797. In 1791, the French Academy of Sciences selected the meridional definition over the pendular definition because the force of gravity varies slightly over the surface of the Earth, which affects the period of a pendulum. To establish a universally accepted foundation for the definition of the metre, more accurate measurements of this meridian were needed. The French Academy of Sciences commissioned an expedition led by Jean Baptiste Joseph Delambre and Pierre Méchain, lasting from 1792 to 1799, which attempted to accurately measure the distance between a belfry in Dunkerque and Montjuïc castle in Barcelona to estimate the length of the meridian arc through Dunkerque. This portion of the meridian, assumed to be the same length as the Paris meridian, was to serve as the basis for the length of the half meridian connecting the North Pole with the Equator. The problem with this approach is that the exact shape of the Earth is not a simple mathematical shape, such as a sphere or oblate spheroid, at the level of precision required for defining a standard of length. The irregular and particular shape of the Earth smoothed to sea level is represented by a mathematical model called a geoid, which literally means "Earth-shaped". Despite these issues, in 1793 France adopted this definition of the metre as its official unit of length based on provisional results from this expedition. However, it was later determined that the first prototype metre bar was short by about 200 micrometres because of miscalculation of the flattening of the Earth, making the prototype about 0.02% shorter than the original proposed definition of the metre. Regardless, this length became the French standard and was progressively adopted by other countries in Europe. The expedition was fictionalised in Denis Guedj, Le Mètre du Monde. Ken Alder wrote factually about the expedition in The Measure of All Things: the seven year odyssey and hidden error that transformed the world. In 1867 at the second general conference of the International Association of Geodesy held in Berlin, the question of an international standard unit of length was discussed in order to combine the measurements made in different countries to determine the size and shape of the Earth. The conference recommended the adoption of the metre and the creation of an international metre commission, according to the proposal of Johann Jacob Baeyer, Adolphe Hirsch and Carlos Ibáñez e Ibáñez de Ibero. In the 1870s and in light of modern precision, a series of international conferences was held to devise new metric standards. The Metre Convention (Convention du Mètre) of 1875 mandated the establishment of a permanent International Bureau of Weights and Measures (BIPM: Bureau International des Poids et Mesures) to be located in Sèvres, France. This new organisation was to construct and preserve a prototype metre bar, distribute national metric prototypes, and maintain comparisons between them and non-metric measurement standards. The organisation created such a bar in 1889 at the first General Conference on Weights and Measures (CGPM: Conférence Générale des Poids et Mesures), establishing the International Prototype Metre as the distance between two lines on a standard bar composed of an alloy of 90% platinum and 10% iridium, measured at the melting point of ice. The original international prototype of the metre is still kept at the BIPM under the conditions specified in 1889. In 1893, the standard metre was first measured with an interferometer by Albert A. Michelson, the inventor of the device and an advocate of using some particular wavelength of light as a standard of length. By 1925, interferometry was in regular use at the BIPM. However, the International Prototype Metre remained the standard until 1960, when the eleventh CGPM defined the metre in the new International System of Units (SI) as equal to 1 650 763.73 wavelengths of the orange-red emission line in the electromagnetic spectrum of the krypton-86 atom in a vacuum. The metre is the length of the path travelled by light in vacuum during a time interval of 1/7008299792458000000♠299792458 of a second. This definition fixed the speed of light in vacuum at exactly 7008299792458000000♠299792458 metres per second (≈7008300000000000000♠300000 km/s). An intended by-product of the 17th CGPM's definition was that it enabled scientists to compare lasers accurately using frequency, resulting in wavelengths with one-fifth the uncertainty involved in the direct comparison of wavelengths, because interferometer errors were eliminated. To further facilitate reproducibility from lab to lab, the 17th CGPM also made the iodine-stabilised helium–neon laser "a recommended radiation" for realising the metre. For the purpose of delineating the metre, the BIPM currently considers the HeNe laser wavelength, λHeNe, to be 6993632991212580000♠632.99121258 nm with an estimated relative standard uncertainty (U) of 6989210000000000000♠2.1×10−11. This uncertainty is currently one limiting factor in laboratory realisations of the metre, and it is several orders of magnitude poorer than that of the second, based upon the caesium fountain atomic clock (U = 6984500000000000000♠5×10−16). Consequently, a realisation of the metre is usually delineated (not defined) today in labs as 7006157980076204200♠1579800.762042(33) wavelengths of helium-neon laser light in a vacuum, the error stated being only that of frequency determination. This bracket notation expressing the error is explained in the article on measurement uncertainty. Practical realisation of the metre is subject to uncertainties in characterising the medium, to various uncertainties of interferometry, and to uncertainties in measuring the frequency of the source. A commonly used medium is air, and the National Institute of Standards and Technology (NIST) has set up an online calculator to convert wavelengths in vacuum to wavelengths in air. As described by NIST, in air, the uncertainties in characterising the medium are dominated by errors in measuring temperature and pressure. Errors in the theoretical formulas used are secondary. By implementing a refractive index correction such as this, an approximate realisation of the metre can be implemented in air, for example, using the formulation of the metre as 7006157980076204200♠1579800.762042(33) wavelengths of helium–neon laser light in vacuum, and converting the wavelengths in a vacuum to wavelengths in air. Air is only one possible medium to use in a realisation of the metre, and any partial vacuum can be used, or some inert atmosphere like helium gas, provided the appropriate corrections for refractive index are implemented. least count resolution of the interferometer. which converts the unit of wavelength λ to metres using c, the speed of light in vacuum in m/s. Here n is the refractive index of the medium in which the measurement is made, and f is the measured frequency of the source. Although conversion from wavelengths to metres introduces an additional error in the overall length due to measurement error in determining the refractive index and the frequency, the measurement of frequency is one of the most accurate measurements available. 8 May 1790 – The French National Assembly decides that the length of the new metre would be equal to the length of a pendulum with a half-period of one second. 30 March 1791 – The French National Assembly accepts the proposal by the French Academy of Sciences that the new definition for the metre be equal to one ten-millionth of the length of a quadrant along the Earth's meridian through Paris, that is the distance from the equator to the north pole along that quadrant. 1795 – Provisional metre bar constructed of brass. Based on Bessel's ellipsoid and legally equal to 443.44 lines on the toise du Pérou (a standard French unit of length from 1747). 10 December 1799 – The French National Assembly specifies the platinum metre bar, constructed on 23 June 1799 and deposited in the National Archives, as the final standard. Legally equal to 443.296 lines on the toise du Pérou. 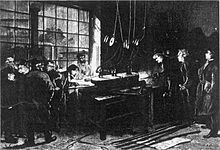 28 September 1889 – The 1st General Conference on Weights and Measures (CGPM) defines the metre as the distance between two lines on a standard bar of an alloy of platinum with 10% iridium, measured at the melting point of ice. 6 October 1927 – The 7th CGPM redefines the metre as the distance, at 0 °C (273 K), between the axes of the two central lines marked on the prototype bar of platinum-iridium, this bar being subject to one standard atmosphere of pressure and supported on two cylinders of at least 10 mm (1 cm) diameter, symmetrically placed in the same horizontal plane at a distance of 571 mm (57.1 cm) from each other. 14 October 1960 – The 11th CGPM defines the metre as 7006165076373000000♠1650763.73 wavelengths in a vacuum of the radiation corresponding to the transition between the 2p10 and 5d5 quantum levels of the krypton-86 atom. 21 October 1983 – The 17th CGPM defines the metre as the length of the path travelled by light in a vacuum during a time interval of 1/299 792 458 of a second. 2002 – The International Committee for Weights and Measures (CIPM) considers the metre to be a unit of proper length and thus recommends this definition be restricted to "lengths ℓ which are sufficiently short for the effects predicted by general relativity to be negligible with respect to the uncertainties of realisation". Platinum-iridium bar at melting point of ice, atmospheric pressure, supported by two rollers (7th CGPM) 1927 n.a. n.a. SI prefixes are often employed to denote decimal multiples and submultiples of the metre, as shown in the table below. As indicated in the table, some are commonly used, while others are not. Long distances are usually expressed in km, astronomical units (149.6 Gm), light-years (10 Pm), or parsecs (31 Pm), rather than in Mm, Gm, Tm, Pm, Em, Zm or Ym; "30 cm", "30 m", and "300 m" are more common than "3 dm", "3 dam", and "3 hm", respectively. The terms micron and (occasionally) millimicron are often used instead of micrometre (μm) and nanometre (nm), but this practice is officially discouraged. Within this table, "inch" and "yard" mean "international inch" and "international yard" respectively, though approximate conversions in the left column hold for both international and survey units. "≡" means "equal by definition" or "is exactly equal to". One metre is exactly equivalent to 10 000/254 inches and to 10 000/9 144 yards. 1 metre is nearly equivalent to 3 feet ​3 3⁄8 inches. This gives an overestimate of 0.125 mm. However, the practice of memorising such conversion formulas has been discouraged in favour of practice and visualisation of metric units. The ancient Egyptian cubit was about 0.5 m (surviving rods are 523–529 mm). Scottish and English definitions of the ell (two cubits) were 941 mm (0.941 m) and 1143 mm (1.143 m) respectively. The ancient Parisian toise (fathom) was slightly shorter than 2 m and was standardised at exactly 2 m in the mesures usuelles system, such that 1 m was exactly ​1⁄2 toise. The Russian verst was 1.0668 km. The Swedish mil was 10.688 km, but was changed to 10 km when Sweden converted to metric units. Wikimedia Commons has media related to Metre. Look up metre in Wiktionary, the free dictionary. ^ a b c "17th General Conference on Weights and Measures (1983), Resolution 1". Retrieved 19 September 2012. ^ "Base unit definitions: Meter". National Institute of Standards and Technology. Retrieved 28 September 2010. ^ The most recent official brochure about the International System of Units (SI), written in French by the Bureau international des poids et mesures, International Bureau of Weights and Measures (BIPM) uses the spelling metre; an English translation, included to make the SI standard more widely accessible also uses the spelling metre (BIPM, 2006, p. 130ff). However, in 2008 the U.S. English translation published by the U.S. National Institute of Standards and Technology (NIST) chose to use the spelling meter in accordance with the United States Government Printing Office Style Manual. The Metric Conversion Act of 1975 gives the Secretary of Commerce of the US the responsibility of interpreting or modifying the SI for use in the US. The Secretary of Commerce delegated this authority to the Director of the National Institute of Standards and Technology (Turner). In 2008, NIST published the US version (Taylor and Thompson, 2008a) of the English text of the eighth edition of the BIPM publication Le Système international d'unités (SI) (BIPM, 2006). In the NIST publication, the spellings "meter", "liter" and "deka" are used rather than "metre", "litre" and "deca" as in the original BIPM English text (Taylor and Thompson (2008a), p. iii). The Director of the NIST officially recognised this publication, together with Taylor and Thompson (2008b), as the "legal interpretation" of the SI for the United States (Turner). Thus, the spelling metre is referred to as the "international spelling"; the spelling meter, as the "American spelling". ^ Naughtin, Pat (2008). "Spelling metre or meter" (PDF). Metrication Matters. Retrieved 12 March 2017. ^ "Meter vs. metre". Grammarist. Retrieved 12 March 2017. ^ The Philippines uses English as an official language and this largely follows American English since the country became a colony of the United States. While the law that converted the country to use the metric system uses metre (Batas Pambansa Blg. 8) following the SI spelling, in actual practice, meter is used in government and everyday commerce, as evidenced by laws (kilometer, Republic Act No. 7160), Supreme Court decisions (meter, G.R. No. 185240), and national standards (centimeter, PNS/BAFS 181:2016). ^ "295-296 (Nordisk familjebok / Uggleupplagan. 18. Mekaniker - Mykale)" [295-296 (Nordic Family Book / Owl Edition. 18. Mechanic - Mycular)]. Stockholm. 1913. ^ Cambridge Advanced Learner's Dictionary. Cambridge University Press. 2008. Retrieved 19 September 2012. , s.v. ammeter, meter, parking meter, speedometer. ^ American Heritage Dictionary of the English Language (3rd ed.). Boston: Houghton Mifflin. 1992. , s.v. meter. ^ "-meter - definition of -meter in English". Oxford Dictionaries. ^ Rooney, Anne (2012). The History of Mathematics. Rosen Publishing Group. p. 65. ISBN 978-1448873692. An identical metric system to that introduced in France was proposed in 1668 by Bishop John Wilkins, a founder of the Royal Society in England. ... he proposed an integrated system of measurement based on a decimal system and almost identical to the modern metric system. His unit of measurement was 997 millimeters - almost exactly a meter. ^ George Sarton (1935). "The First Explanation of Decimal Fractions and Measures (1585). Together with a History of the Decimal Idea and a Facsimile (No. XVII) of Stevin's Disme". Isis. 23 (1): 153–244. doi:10.1086/346940. JSTOR 225223. ^ ('decimalization is not of the essence of the metric system; the real significance of this is that it was the first great attempt to define terrestrial units of measure in terms of an unvarying astronomical or geodetic constant.) The metre was in fact defined as one ten-millionth of one-quarter of the earth's circumference at sea-level.' Joseph Needham, Science and Civilisation in China, Cambridge University Press, 1962 vol.4, pt.1, p.42. ^ Agnoli, Paolo (2004). Il senso della misura: la codifica della realtà tra filosofia, scienza ed esistenza umana (in Italian). Armando Editore. pp. 93–94, 101. ISBN 9788883585326. Retrieved 13 October 2015. ^ Rapport sur le choix d'une unité de mesure, lu à l'Académie des sciences, le 19 mars 1791 (in French). Gallica.bnf.fr. 15 October 2007. Retrieved 25 March 2013. ^ Paolo Agnoli and Giulio D’Agostini,'Why does the meter beat the second?,' December, 2004 pp.1–29. ^ Oxford English Dictionary, Clarendon Press 2nd ed.1989, vol.IX p.697 col.3. ^ a b Hirsch, Adolphe (1891). "Don Carlos IBANEZ (1825 - 1891)" (PDF). Bureau International des Poids et Mesures. p. 8. Retrieved 22 May 2017. ^ "BIPM - International Metre Commission". www.bipm.org. Retrieved 26 May 2017. ^ "A Note on the History of the IAG". IAG Homepage. Retrieved 26 May 2017. ^ Marion, Jerry B. (1982). Physics For Science and Engineering. CBS College Publishing. p. 3. ISBN 978-4-8337-0098-6. ^ a b c "Iodine (λ ≈ 633 nm)" (PDF). MEP (Mise en Pratique). BIPM. 2003. Retrieved 16 December 2011. ^ The term "relative standard uncertainty" is explained by NIST on their web site: "Standard Uncertainty and Relative Standard Uncertainty". The NIST Reference on constants, units, and uncertainties: Fundamental physical constants. NIST. Retrieved 19 December 2011. ^ National Research Council 2010. ^ a b A more detailed listing of errors can be found in Beers, John S; Penzes, William B (December 1992). "§4 Re-evaluation of measurement errors" (PDF). NIST length scale interferometer measurement assurance; NIST document NISTIR 4998. pp. 9 ff. Retrieved 17 December 2011. ^ The formulas used in the calculator and the documentation behind them are found at "Engineering metrology toolbox: Refractive index of air calculator". NIST. 23 September 2010. Retrieved 16 December 2011. The choice is offered to use either the modified Edlén equation or the Ciddor equation. The documentation provides a discussion of how to choose between the two possibilities. ^ "§VI: Uncertainty and range of validity". Engineering metrology toolbox: Refractive index of air calculator. NIST. 23 September 2010. Retrieved 16 December 2011. ^ Dunning, F. B.; Hulet, Randall G. (1997). "Physical limits on accuracy and resolution: setting the scale". Atomic, molecular, and optical physics: electromagnetic radiation, Volume 29, Part 3. Academic Press. p. 316. ISBN 978-0-12-475977-0. The error [introduced by using air] can be reduced tenfold if the chamber is filled with an atmosphere of helium rather than air. ^ "Recommended values of standard frequencies". BIPM. 9 September 2010. Retrieved 22 January 2012. ^ National Physical Laboratory 2010. ^ The BIPM maintains a list of recommended radiations on their web site. ^ a b Zagar, 1999, pp. 6–65ff. Judson, Lewis V. (1976-10-01) . Barbrow, Louis E., ed. Weights and Measures Standards of the United States, a brief history (PDF). Derived from a prior work by Louis A. Fisher (1905). USA: US Department of Commerce, National Bureau of Standards. LCCN 76-600055. NBS Special Publication 447; NIST SP 447; 003-003-01654-3. Retrieved 12 October 2015. Guedj, Denis (2001). La Mesure du Monde [The Measure of the World]. Translated by Goldhammer, Art. Chicago: University of Chicago Press. "The International System of Units (SI)" (PDF) (in French). Bureau International des Poids et Mesures. 2006. Retrieved 18 August 2008. HTML version. Retrieved 24 August 2008. Bureau International des Poids et Mesures. (n.d.). Resolutions of the CGPM (search facility). Retrieved 3 June 2006. Bureau International des Poids et Mesures. (n.d.). The BIPM and the evolution of the definition of the metre. Retrieved 3 June 2006. Cardarelli, François (2003). "Chapter 2: The International system of Units" (PDF). Encydopaedia of scientific units, weights, and measures: their SI equivalences and origins. Springer-Verlag London Limited. Table 2.1, p. 5. ISBN 978-1-85233-682-0. Retrieved 26 January 2017. Data from Giacomo, P., Du platine à la lumière [From platinum to light], Bull. Bur. Nat. Metrologie, 102 (1995) 5–14. Humerfelt, Sigurd. (26 October 2010). How WGS 84 defines Earth. Retrieved 29 April 2011. Layer, H.P. (2008). Length—Evolution from Measurement Standard to a Fundamental Constant. Gaithersburg, MD: National Institute of Standards and Technology. Retrieved 18 August 2008. Mohr, P., Taylor, B.N., and David B. Newell, D. (28 December 2007). CODATA Recommended Values of the Fundamental Physical Constants: 2006. Gaithersburg, MD: National Institute of Standards and Technology. Retrieved 18 August 2008. SI base units. Retrieved 18 August 2008. Definitions of the SI base units. Retrieved 18 August 2008. Historical context of the SI: Meter. Retrieved 26 May 2010. "Maintaining the SI unit of length". National Research Council Canada. 5 February 2010. Archived from the original on 4 December 2011. Penzes, W. (29 December 2005). Time Line for the Definition of the Meter. Gaithersburg, MD: National Institute of Standards and Technology – Precision Engineering Division. Retrieved 4 December 2010. Taylor, B.N. and Thompson, A. (Eds.). (2008a). The International System of Units (SI). United States version of the English text of the eighth edition (2006) of the International Bureau of Weights and Measures publication Le Système International d’ Unités (SI) (Special Publication 330). Gaithersburg, MD: National Institute of Standards and Technology. Retrieved 18 August 2008. Taylor, B.N. and Thompson, A. (2008b). Guide for the Use of the International System of Units (Special Publication 811). Gaithersburg, MD: National Institute of Standards and Technology. Retrieved 23 August 2008. Tibo Qorl. (2005) The History of the Meter (Translated by Sibille Rouzaud). Retrieved 18 August 2008. Zagar, B.G. (1999). Laser interferometer displacement sensors in J.G. Webster (ed.). The Measurement, Instrumentation, and Sensors Handbook. CRC Press. ISBN 0-8493-8347-1.